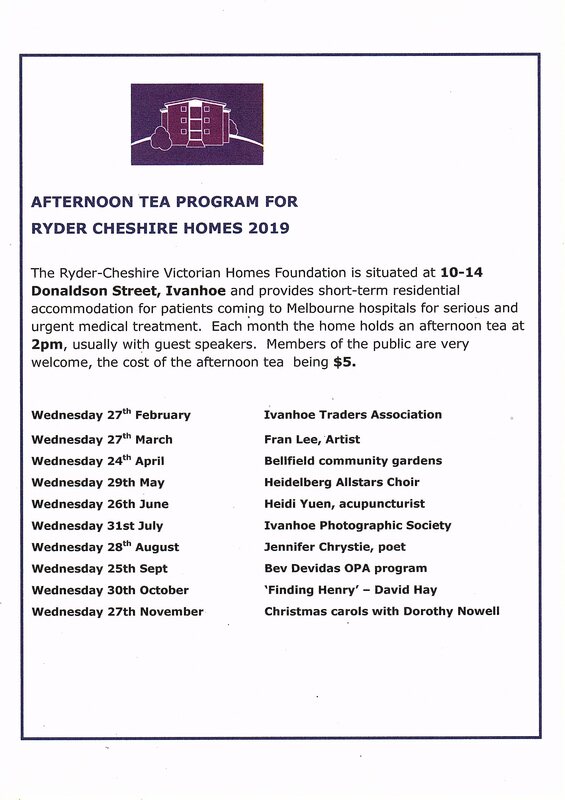 At Ivanhoe Homes on the Last Wednesday of each month at 2pm we have a fundraising afternoon tea. We meet in the Community room to hear a special guest speaker. The cost is $5 per person. It was full house at the afternoon tea as Fran Lee gave a superb presentation about her Significant Trees of Banyule exhibition. Fran gave the background to her interest in indigenous and native trees in her local area. She said that the City of Banyule was one of the few councils who had a register of the significant trees growing in the area. This encouraged her to seek out the trees and make portraits of some of her favourite ones including a sugar gum, manna gum and red ironbarks. She noted how important it was to retain these trees as some were more than 400 years old and were still the habitat of many native birds. Residents and visitors were able to place the trees on maps she handed out also and it’s hoped they will be able to visit them all soon. She also detailed the process of painting particularly the leaves of the gum leaves, putting layer up on layer of paint to reflect the foliage of the trees. She also prepares her own paints and canvases so the whole process is very time consuming. We were very pleased to welcome Councillor Tom Melican who was taken on a short tour of the facility afterwards. Wednesday 27th February was the launch of the 2019 afternoon tea program. It was a full house as Stavros Zikou from Ivanhoe Traders Association gave a terrific overview of the challenges facing shopping strips. Liz from Australian Chocolate Emporium also gave a short presentation and distributed some delicious samples from her shop. Wednesday was also the launch of the partnership between Ryder Cheshire Homes and the CWA Alphington and we were spoiled with scrumptious cakes and slices.